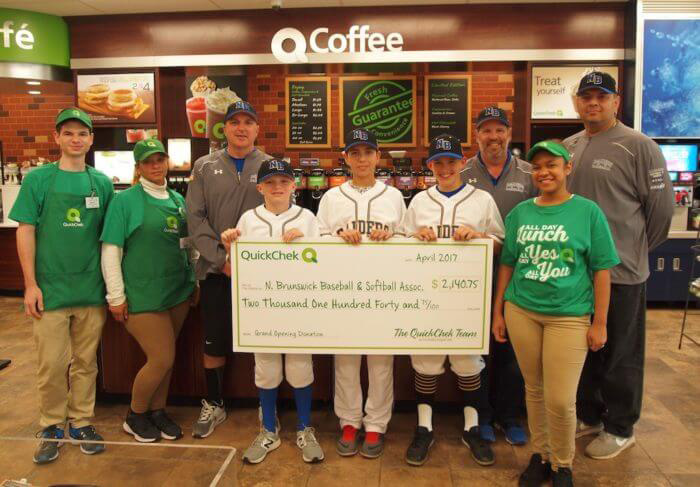 NORTH BRUNSWICK, NJ — Committed to giving back to the communities it serves, QuickChek donated $2,140.75 to the North Brunswick Baseball & Softball Association as part of its grand opening celebration of its new store in the township. The Whitehouse Station, NJ-based fresh convenience market chain opened a new 5,496-square-foot store located at 1196 How Lane on Tuesday, February 21, and donated a portion of the sales of every sub, sandwich and wrap sold in the store during its first 30 days. Priding itself on being fresh and local, QuickChek stores provide one-stop shopping, offering a wide variety of grocery and market items including fresh baked goods from an in-store bakery and excellent customer service provided by locally hired team members. The company continues to expand its mobile ordering menu to meet the needs of today’s on-the-go consumer and beginning May 15 will be offering its All Day Lunch, All Day Yes, All Day You six-inch subs for just $3. The new North Brunswick store is open 24 hours a day, enabling customers to create delicious handcrafted oven-toasted fresh subs, sandwiches, wraps and salads and personalized hot and cold beverages exactly as they want them, any time of day or night. Amenities include no-fee ATMs which provide additional added value to consumers; indoor seating for 13 people and outdoor seating for eight; eight gasoline pumps offering high-quality fuel at value prices; and 59 parking spaces. QuickChek made the presentation in the store on May 9. Pictured (L-R) QuickChek store team members Martin Prokai and Jessica Mejas, North Brunswick Baseball & Softball Association Vice President John Drury, players Conor Drury, Frank Garbolino, and Zack Konstantinovsky, North Brunswick Baseball & Softball Association President David Rosenberg, Coach Boris Konstantinovsky, and store team member Juana Gonell.